Another early start today, we were awake at 6am! The plan for today was Epcot. We took our time getting ready and arrived at Epcot at 8.30. 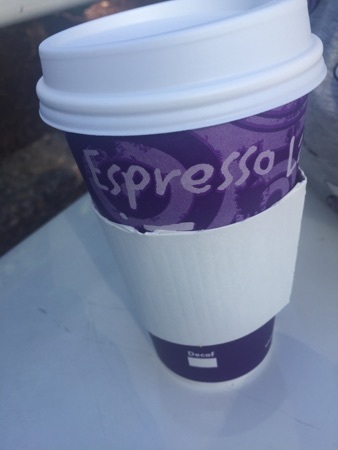 We headed to the Joffrey's stand and picked up 2 cups of coffee, these were $3.39 each. 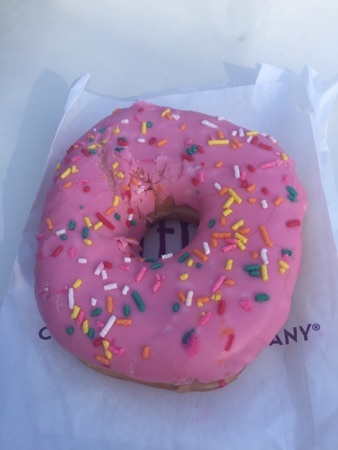 We also picked up a large pink doughnut to share between the 3 of us, this was $3.99 and was huge! It easily did the 3 of us and was really tasty. The doughnut itself was really moist and the icing was soft. After our sugar and caffeine fix we had fastpasses for the character spot, living with the land and frozen ever after. The flower and garden festival is stunning, the topiaries and flowers are just amazing! For lunch we headed round to the American pavilion of the world showcase. We stopped at the smokehouse stand which is there as part of the flower and garden festival. 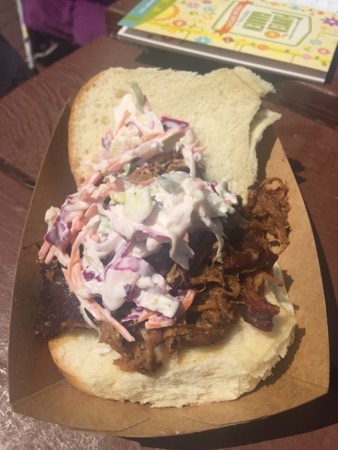 I got a pulled pig slider, this was nice, there was plenty of pulled pork and it had quite a kick to it but the coleslaw helped balance that out. This cost $6.49 but wasn't quite enough for lunch. 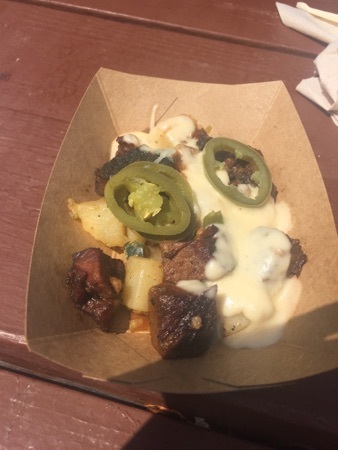 DH had the Beef brisket burnt ends hash, this was served with white cheddar fondue and pickled jalapeños. He wasn't impressed at all, he didn't think it was very good and there wasn't very much of it for its $6.99 price tag. DD had a kids cheeseburger meal from the liberty inn tavern, this came with chocolate milk and a chocolate chip cookie. DD absolutely demolished this! She really enjoyed it. 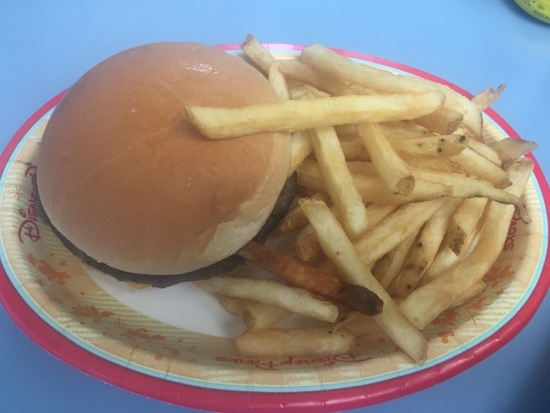 This should have been $6.99 but liberty inn currently do 20% off passholder discount which was a bonus! After lunch we headed back to the hotel and spent some time at the pool. For dinner we decided on millers ale house. This is a favourite of mine but DH is not a fan! 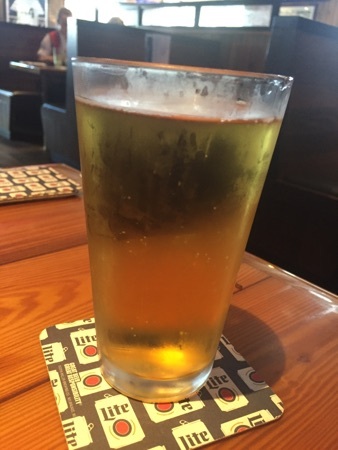 We arrived about 5 and I decided to get a beer with mine. Millers lite was $2.50 a pint. DH and DD both had Pepsi. DH and I decided to share 2 mains. 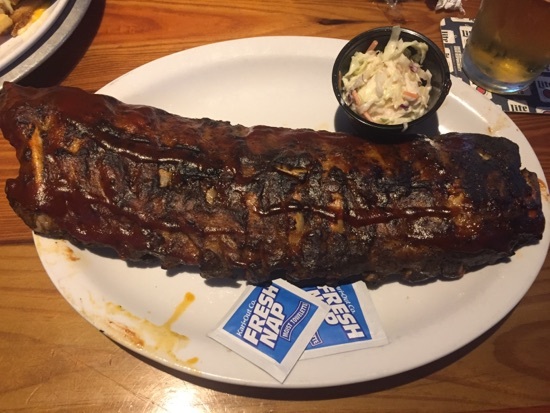 Today's special offer was a full rack of ribs served with coleslaw and a side for $11.99 so we got them. These were lovely, the meat fell off the bone and was really tender. 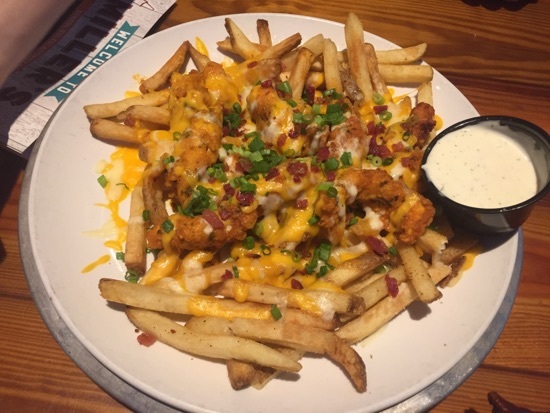 We also got the zinger mountain melt to share. This is my usual when we go to millers. It's chips, chicken zingers in medium garlic sauce, cheese, bacon bits and spring onions, it's served with blue cheese sauce. These are so good! Ridiculously moreish, I was so full in the end but just couldn't stop eating. 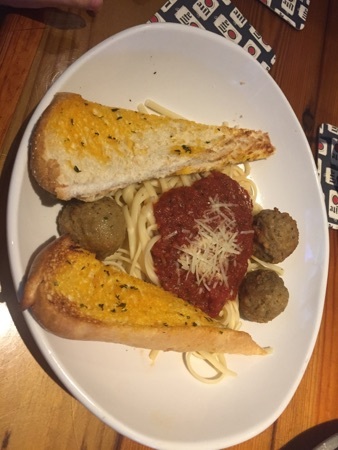 DD got the kids spaghetti and meatballs, this came with a couple of pieces of garlic bread. DD wasn't too impressed and didn't eat a lot of this. The meal came to $35 which we thought was fantastic value, DH agreed that this was the best meal we've had so far on this trip and enjoyed millers this time. 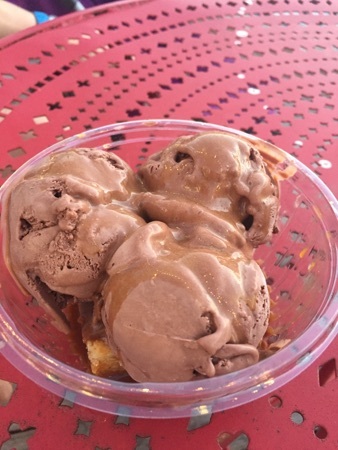 We decided to head back to epcot for the evening, after a walk round the world showcase we headed out to the boardwalk and to ample hills creamery. I've been looking forward to getting back here since our last visit last July! I knew exactly what I wanted... ooey gooey buttercake sundae with dark chocolate ice cream and caramel drizzle. Oh my gosh this is sooooooo good! The ooey gooey buttercake is like a cross between a brownie and shortbread, it's so soft and chewy and rich. The dark chocolate ice cream is just like really good chocolate ice cream and the caramel drizzle is just because I love caramel. 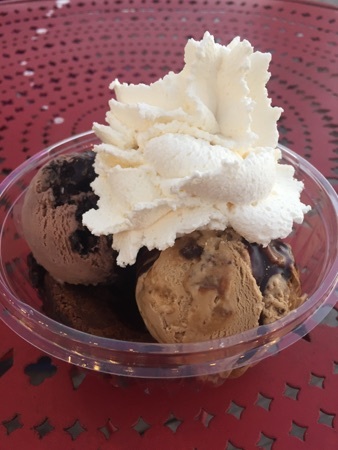 DH got a brownie sundae topped with 2 scoops of coffee toffee coffee ice cream and 1 chocolate milk and cookies ice cream. He had it drizzled with hot fudge sauce and topped with whipped cream. He said this was really good! We both shared our sundaes with DD and she actually preferred DH's which was fine by my as it meant all the more for me to eat! These are $8.49 each so abit on the expensive side but totally worth it. New Photo Added by missdopey - 11 Apr 17 2:54 AM. Oooh - it all looks delicious. We do love Miller's ribs on their specials night, although your zinger mountain melt looks a bit tasty too. 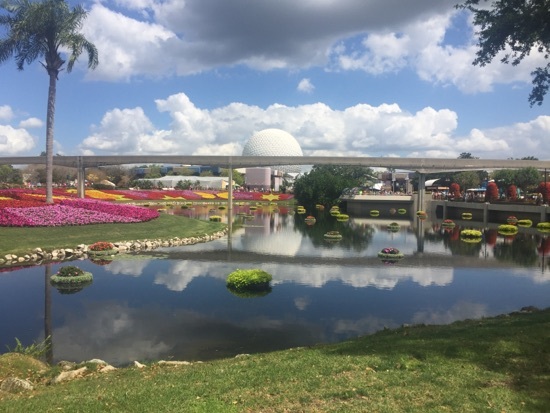 Wow - what a gorgeous picture of Epcot with all the flowers. Fab food day. The slider from F&G looks great & you can't beat a Zinger Mountain melt. That's my dad's favourite from Millers - zingers! He talks about them all the time! Wow that sundae looks good - that's gone on the list!